Often referred as the Gem of Orissan Architecture, Muktesvara Temple deserves special attention when it comes about art and architecture. 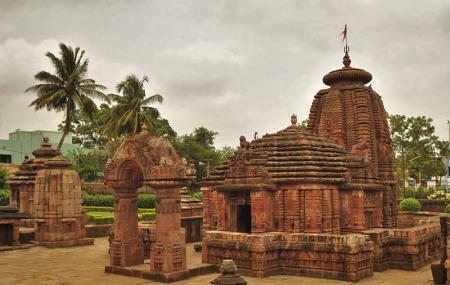 Dedicated to Lord Shiva, this temple is said to be one of the most significant temples of Bhubaneshwar. The name ‘mukteshvara” means “Lord who gives freedom through yoga”. This fact is further proved with the sculptures in different poses of meditation, carved on the red stone walls of the temple. Built in 950 A.D., the brilliant craftwork on the temple’s wall proves the creativity of the sculptors of that age. Beautiful sculptures on the exterior walls of the temple depicting folk tales and stories from Panchatantra. The Jagmohana (porch), ornated with 8 petals lotus carved on the ceiling. Sacred tank on the eastern side of the temple which is believed to cure a person’s infertility. The best time to visit this temple is in January when Mukteshwar dance festival is held on the temple ground. Follow the Hindu rituals while visiting the temple. Seek permission before taking photograph. How popular is Mukteshvara Temple? People normally club together Orissa State Museum and Parashurameshvara Temple while planning their visit to Mukteshvara Temple. A breathtaking temple dedicated to Lord Shiva, the Mukteswara Temple is located in the old town of Bhubaneswar. Exquisite carvings & sculptures welcome you to this beautiful temple. The temple can be reached by shared rickshaw or cabs such as Uber. The temple is mesmerizing & is a photographer's delight. You can get brilliant pics even with a good phone camera, & don't necessarily need a DSLR. Enjoy the magnificence of the temple & allow it to sink in. Please DO NOT climb on top of the compound walls or any other piece of architecture, because they get damaged. Seeing the parents of a young boy encouraging him to climb the wall for a picture, annoyed me a lot. If this is the behavior of the educated, what moral right would we have to educate others? Please refrain from such activities.